How Much Money Do Travel Counsellors Earn? For aspirants to become travel counsellors, you are never wrong in choosing this career path. This is one of the most promising jobs in the industry that offers lucrative salary. These professionals are described as individuals who help other people on their tour packages, travel destinations as well as arranging trips, airfares and hotel accommodations and receiving payments. They also assist clients regarding travel documents needed in a certain destination. Given their duties, personal or business trips are made more comfortable and convenient. An approximate statistics shows that almost 90% of travel counsellors are employed at travel agencies, tourism firms or hotel chains while 10% are self-employed. Salary of these professionals basically starts at $30,000 to $41,400 or a median hourly wage of almost $16.71 for positions in the entry-level. They should have good organizational and research skills to advise clients everything about they need to know on the desired travel destination. They should also have earned travel and tourism programs to be qualified which generally range for two years in community base colleges while six months for private career colleges. 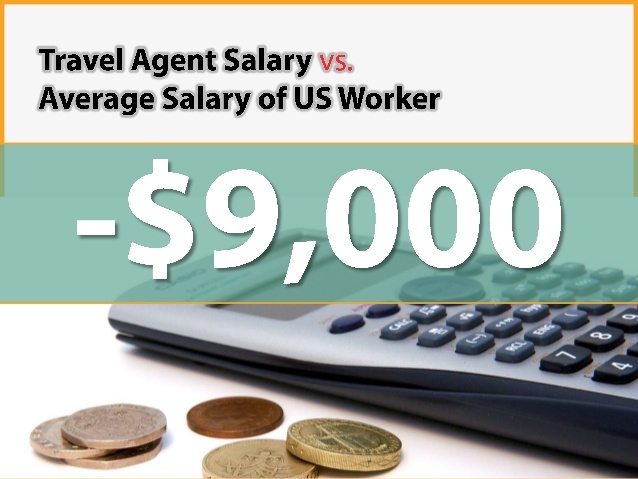 Travel agents who are good at sales, knowledgeable and experienced can earn an income of more than $100,000 per year. Some of them have earned a four-year program from travel and tourism universities which provide them concrete knowledge and trainings about the industry. Most income of these travel professionals depend on their potential to attract sales and setting goals on the income level they want. You will be learning to become more independent for higher income potential which solely depends on your intelligence and skills to handle clients. There is an on-going process in the education of these individuals by earning specialization in various areas. Usually, agents on specialized fields can earn more. Most of travel agents earn a 10% commission from airfare reservations to hotel accommodations. Fortunately, agents can earn unlimited commission which are controlled by them alone. Some companies have in-house system that allows agents to alter margins leading to a full control of their commission rates. This will also adjust their earning per bookings of clients which means the more reservations especially on holidays is the more earnings they gain. Likewise, they are also given privileged and benefits like travel discounts on airfares, hotels and cruise ships. Being a travel agent, you are given freedom to work on your own at your convenience. You have a complete flexibility to work depending on your own schedule. Through this career that you can spend time and commitment to your family while earning income for them. As long as you the aptitude for selling and work under pressure if needed, you are on your way to gain more income potential. Check more info here! New travel agents are given more opportunity to have a stable employment and good source of income as more and more agents are retiring. Also, as certified travel counsellors, all are given chances to earn as much as they want with demands in the field on the average age between 50-55 years old. Are There Challenges that Impede the Income of Travel Counsellors? ​The slow economic growth, terrorism or the value of the recent currency may affect the salary and income of travel counsellors but not directly affect pay freeze. There is a growing number of people who wish to travel either for relaxation or business purposes, leading to the ongoing demands of professionals in the field of travel and tourism industry.